The Karelian Bear Dog, called Karjalankarhukoira in the breed’s native Finland, is a strong, alert, and fearless breed that is capable of hunting or treeing small-to-large game–even aggressive game such as bears, lynxes, wild boars, wolves, and moose. It makes the list of the top ten most common dog breeds in Finland, where people consider the Karelian Bear Dog a national treasure. Karelian Bear Dogs were bred to be naturally aggressive to other animals for hunting purposes. For that reason, it takes a good deal of socialization and training to keep them as household companions. Also, they have high energy and exercise requirements. However, Karelian Bear Dogs, are extremely loyal to their human families and are very protective watchdogs. So, for an owner willing to put in the work, socialize, train diligently, and give plenty of open space and physical activity, the Karelian Bear Dog can be a calm, loving family member. See below for complete list of Karelian Bear Dog characteristics! If you’re looking to buy a Karelian Bear Dog for sale, click here. Additionally, if you’re looking to buy Karelian Bear Dog puppies, click here. Confident, alert, and brave are all words that describe the Karelian Bear Dog, and those are necessary traits for a dog that was bred to help hunt aggressive, dangerous animals such as bears, lynxes, and wild boars. Karelian Bear Dogs have high exercise requirements, and they prefer large yards where they can run freely in addition to regular walks. They are intelligent and need human companionship, or else they may try to find their own fun by digging, chewing, and making a mess around the home. All of this is to say that the Karelian Bear Dog is not a good choice for novice dog owners, apartment dwellers, or those who need to be away from home for many hours during the day. However, an owner that is willing to tackle the Karelian Bear Dog's exercise, socialization, and training needs with enthusiasm and confidence will be rewarded with a fiercely loyal and protective companion for life that will love the whole family. Karelian Bear Dog is sometimes spelled "Carelian Bear Dog" with a "C" in Finland where the breed originated. It is also called Karjalankarhukoira in Finnish. The Karelian Bear Dog was bred to hunt even large, aggressive game such as bears, lynxes, wild boars, wolves, and moose. This breed is naturally aggressive to other animals, so it will take a good deal of socialization if it is to be kept as a household companion. These dogs may do best in a home with no other pets. In the United States, Karelian Bear dogs have been used at Yosemite and Glacier National Parks for bear control, as well as with the Washington State Department of Fish and Wildlife. Modern Karelian Bear Dog coats are mostly black with white markings, and some have brown highlights on their black fur. Karelian Bear Dogs are still prized by big game hunters, but for those that want a household pet, they also make excellent watchdogs. The ancestry of the Karelian Bear Dog can be traced to neolithic times, according to archaeological findings, when dogs similar to the modern breed followed human settlers to regions of Scandinavia and Europe. The Karelian Bear Dog is a Spitz-type breed with an ancestry that goes way back. In fact, archaeological records suggest that dogs similar to the modern Karelian Bear Dog existed in northeastern Europe and Scandinavia as far back as Neolithic times, and they likely followed the first human settlers to the area thousands of years ago. People who lived in the region depended on successful hunts to eat and survive, and Karelian Bear Dogs were kept and bred to help with that task. They were most often used to hunt squirrel, hares, and other small game, but they were also capable of hunting large, aggressive animals, as well. Two Karelian Bear Dogs could easily tree a bear and bark at it until their human could catch up and bring the animal down. The breed needed to be hardy to withstand the climate and wildlife of the region. These dogs are still used to hunt elk and other large animals in Scandinavia today. Originally, Karelian Bear Dogs' coats came in many colors, including wolf gray, red, or black and tan, though modern breed standards have led to their coats being mostly black and white. Karelian Bear Dogs almost went extinct after World War II. In fact, all Karelian Bear Dogs alive today can trace their ancestry to 40 dogs that were saved during that time. Since then, the breed has grown more popular, and in addition to being one of the top ten most common breeds in Finland, Karelian Bear Dogs are also bred in North America and countries in Europe. 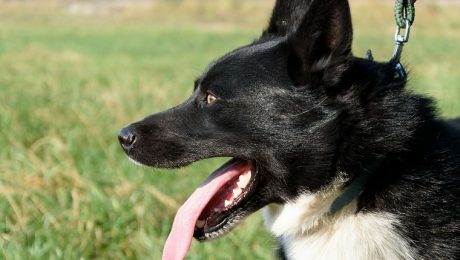 The American Kennel Club does not fully recognize the Karelian Bear Dog, though it is included in their Foundation Stock Service which helps keep records of the breed's lineage and allows them to compete in some competitions. Male Karelian Bear Dogs are larger on average than females, standing at 21 to 24 inches in height at the shoulder, while females are usually around 19 to 22 inches in height. Dogs of this breed tend to weigh between 44 and 50 pounds, though individual Karelian Bear Dogs may be larger or smaller. Karelian Bear Dogs are energetic, intelligent, and intense. They are prized for their natural hunting abilities, though this can make them aggressive toward other animals and dogs. Socialization and training need to begin early. Their hunting instincts may also cause Karelian Bear Dogs to wander or chase after animals. They do best with a large, fenced-in yard that will keep them secure and prevent them from getting lost while allowing them to run and burn off energy. As with many intelligent and energetic dogs, boredom is the enemy. A Karelian Bear Dog that isn't mentally and physically stimulated can act out in destructive ways. A tired dog is a happy dog, and that's especially true of this breed. Karelian Bear Dogs make excellent watchdogs, and even though they are not naturally trusting of strangers, they are highly loyal and protective of their human families. Their instinct is to bark and alert their humans to anything that may be a threat or anything that may simply be of interest. Karelian Bear Dogs require a dedicated, confident trainer who will rely on positive reinforcement. They are usually prized by hunters, but Karelian Bear Dogs can make loving family companions when their needs are addressed. The Karelian Bear Dog breed is known to be fairly healthy with few of the genetic conditions that affect other purebreds. They may, however, be prone to hip dysplasia or eye problems. It is important for owners to watch out for these conditions and maintain regular vet visits to catch and address any health concerns. Karelian Bear Dogs tend to have fast-growing nails that must be trimmed or ground down often to avoid cracking, splitting, and breaking. Their teeth should be brushed regularly as recommended by a veterinarian. Their ears should be checked for signs of infection, parasites, or debris and kept clean. Keep up with regular vet visits to maintain good health for your Karelian Bear Dog. A Karelian Bear Dog diet should be formulated for a mid-sized breed with above-average energy and exercise needs, though they often eat less than other dogs of their weight and energy level. You should consult your veterinarian or professional nutritionist for advice on what to feed your Karelian Bear Dog and the correct portion sizes. Their dietary needs will change as they grow from puppyhood to adulthood and senior age. Stay on top of these nutritional requirements. Although ancestors of Karelian Bear Dogs had coats of wolf gray, red, or black and tan, modern breed standards dictate that their coat should be mostly black with white markings. Their black fur may be slightly tinted with brown highlights. Karelian Bear Dogs have an outer coat of straight, stiff hairs, as well as an undercoat that is soft and thick. Their coat protects them in all weather, though it is particularly suited to keep them warm through the Scandinavian winter. Karelian Bear Dogs are average shedders, and they shed more heavily twice a year as their seasonal coat blows out. Weekly brushing should be enough to loosen dead hairs and keep the shedding under control. An occasional bath or bathing as needed should be sufficient, as most Karelian Bear Dogs do not have the usual "doggy odor." Karelian Bear Dogs are fairly good with children, especially members of their own household. They are playful dogs, though they can be intense and play rough. 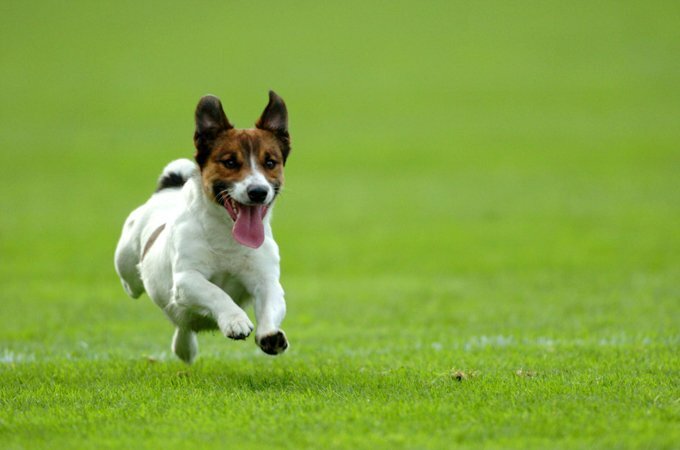 Always keep an eye on children and dogs during playtime, even if a dog is well trained and not aggressive. Instruct kids on how to treat pets gently and appropriately. The Karelian Bear Dog is not overly trusting of strangers, so friends and young playmates that visit must be introduced, and the resident pooch must have time to relax and space to get used to the new person. The Karelian Bear Dog may not be the best breed for children who are very young and inexperienced with dogs, as they may be accidentally knocked over or injured by an overly enthusiastic pup during play. When it comes to other pets and dogs, the Karelian Bear Dog can be downright aggressive. Socialization training must begin early if they are to overcome their natural tendency to fight with other animals. Even then, the Karelian Bear Dog may be best suited to a home where they can be the sole pet. Though there are many breeders of Karelian Bear Dogs that occasionally help rescue dogs from shelters and place them in forever homes, there are few, if any, groups specifically dedicated to only rescuing Karelian Bear Dogs. If you are interested in adopting a Karelian Bear Dog, check your local shelter, or you can take a look at our adoption page that lets you search for adoptable dogs by breed and location.